A childhood park in my hometown is looking to update the equipment. After hearing this news I started to think about the many hours I spent there playing. I remember there being swings, a shelter, a merry go round, and a climber that looked like a friendly spider. It will be bittersweet to see the updated look the park will get. On one hand, all of the things I played on will be gone. But on the other hand, newer and safer equipment will be in place for kids to play on! I remember spending a lot of time climbing up and down the spider legs and around the dome that made the body. It was helpful when it came to imaginative play as well! All sorts of games could be invented and I remember hanging upside down by my knees from the bars on the spider. If keeping a similar look to what already exists is important, then it can be done! We offer many products that can fit the classic equipment that already exists. 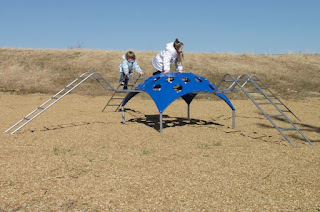 Charlotte the Spider Climber is a great choice for an updated spider climber. This climber helps build strength and balancing skills. While keeping an older look and style to a playground may be important to a town, updating equipment is definitely necessary. Updating equipment not only improves the overall look of a playground, but it improves safety as well.